Q: What is NVIAC's Purpose? Q: What schools make up the NVIAC? Q: To whom do we address concerns, compliments or complaints? Q: What is the NVIAC Procedure Manual and how does it relate to the Constitution? Q: What is the NVIAC Code of Conduct? Q: What is the Christ-like Character trophy? Q: What is the latest guidance on Concussion injuries, including training for Coaches, Parents, etc.? Q: What rules govern NVIAC play? Q: What are the ages and grades for Middle School and Varsity team? Q: Is it true that a soccer player cannot play in the next game if he or she gets a red card? Q: How does the site work? Q: Where can I find a list of all games played? Q: How can I view the NVIAC pages on my smartphone? A: From the NVIAC Constitution ARTICLE I - BACKGROUND, Section 2: To bring glory to Jesus Christ. The member schools of the NVIAC, realizing the benefits that occur for our students from uniting in our athletic goals, shall strive to promote and administer athletic competition which will enhance the development of our students and the relationships of the member schools. A: The current member list is here. A: Feedback is always welcome, as the NVIAC organization seeks to improve its practices so that we can do even more to bring glory to Jesus Christ. If you have feedback of any kind, your first point of contact is your organization\'s coach or Athletic Director (AD). (NOTE: If the feedback involves the website, please send your email to webmaster@nviac.com. If the matter needs to be referred to the Executive Board, the webmaster will do so and let you know). If you are not satisfied with the results, there are steps to take in resolving conflicts in the NVIAC Procedure Manual, Article I, Section 2. Finally, if you wish to personally contact the President of NVIAC, click on the Contact Us link and your comment or question will go directly to the current President. A: The Procedure Manual provides more dynamic procedures to augment expand on the basic guidance in the Constitution. See the NVIAC Constitution, ARTICLE I - BACKGROUND, Section 1. PRECEDENCE - The NVIAC is governed by the provisions contained in this Constitution, NVIAC Procedure Manual, and NVIAC minutes approved by the Governing Body. If a conflict arises, the precedence will be the Constitution, Procedure Manual, and NVIAC Minutes, in that order. A: Every player, coach, assistant, and parent must sign the NVIAC Code of Conduct form that is on the NVIAC forms page. A: Each season, the Best Christ-like Character Award (see the NVIAC Constitution, Article V, Section 11-c) is determined by an assessment of a school\'s whole attitude: players, coaches, and fans. Athletic Directors (or their representatives) from teams participating in regular-season play will cast one vote at the end of regular-season play to elect the team for The Best Christ-like Character Award. The Best Christ-like Character trophy will be the same size as the First Place trophy. A: Please see the NFHS Training Site. Click here to go there. A: The rules are detailed in the NVIAC Procedure Manual, Article VI. A: Please see the NVIAC Constitution, Article V, General Rules, Sections 4 and 6, and Article VII, Definitions, paragraphs a and b for details, but briefly, the eligibility requirements -- for homeschoolers in particular -- are these: "students planning to graduate within the next four years are not eligible to play on MS teams". Middle School players are 8th grade and below (5th graders okay if the school wants to do that) -- no 9th graders can play on a Middle School team. A: Yes. If a player gets a Red card (or two Yellow cards, which equate to a Red), they cannot play in the very next NVIAC League game. If tournament play is next game, they miss the tournament game. See the NVIAC Procedure Manual, ARTICLE VI - NVIAC SANCTIONED SPORTS AND GAME RULES, Section 3-a-6. A: Extensive help is available. Please choose About NVIAC-Help to open the NVIAC website Help Page. 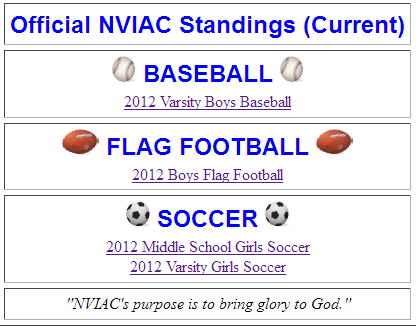 A: Click on the Standings Menu option and scroll to the bottom for a list of all games played by this League Division. This table is sortable -- click on any column heading to sort on that column. 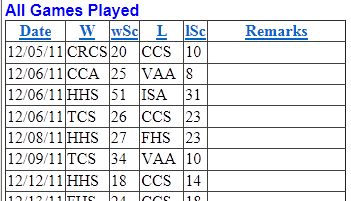 While you can verify the games on the Standings grid at the top of the page, you can get a vertical list of games played in this table -- it may make it easier to search for a missing game. First click on the W column and check off the games on the team's list of games won. Then click on the L column and check off the games on the team's list of games lost. when you click on a current game, you will see the Mini-Standings page for that team. 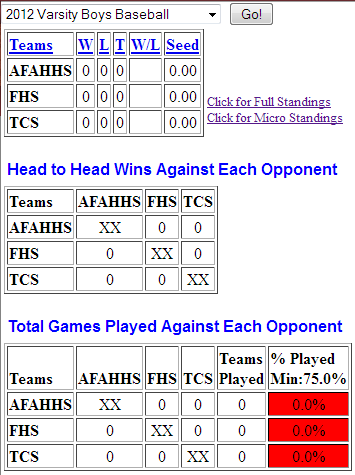 Note that from this page, you can view the Micro Standings page, or go the Full Standings page, as desired. "Glorifying Jesus Christ in everything we do"